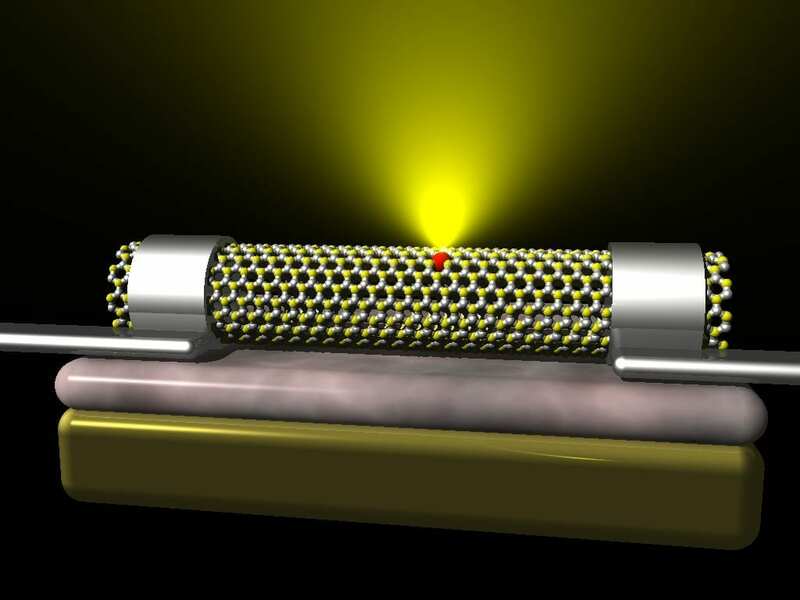 University of the Basque Country researchers have developed and patented a new source of light emitter based on boron nitride nanotubes and suitable for developing high-efficiency optoelectronic devices. Boron nitride is a promising material in the field of nanotechnology, thanks to its excellent insulating properties, resistance and two-dimensional structure similar to graphene. And specifically, the properties of hexagonal boron nitride, the focus of this research, are far superior to those of other metals and semiconductors currently being used as light emitters, for example, in applications linked to optical storage (DVD) or communications. “It is extremely efficient in ultraviolet light emission, one of the best currently available on the market,” remarked the UPV/EHU researcher Angel Rubio. The research carried out by the UPV/EHU’s NanoBio Spectroscopy Group has come up with a solution to overcome this limitation, and open up the door to the use of hexagonal boron nitride nanotubes in commercial applications. Rubio highlighted “the simplicity” of the device proposed. “It’s a device that functions with defects, it does not have to be pure, and it’s very easy to build and control.” Nanotubes can be synthesised using standard methods in the scientific community for producing inorganic nanotubes; the structures synthesised as a result have natural defects, and it is possible to incorporate more if you want by means of simple, post-synthesis irradiation processes. “It has a traditional transistor configuration, and what we are proposing would work with current electronic devices,” he stressed. The “less attractive” part, as specified by Rubio, is that boron nitride nanotubes are still only produced in very small quantities, and as yet there is no economically viable synthesis process on a commercial scale. March 26, 2019 - Goodfellow Offers Boron Nitride Nanotubes with Bandgap About 5.5 eV ThomasNet NewsJoin the Top Industrial Newsletter — Subscribe to our newsletter and join the community of 450,000+ industry professionals focused on products and services. April 12, 2019 - 'Deep Learning' Agents Give Insight into Novel 2D Materials R & D MagazineEngineers show faster techniques to model atom-flat materials for bottom-up design. April 10, 2019 - Boron Nitride Nanotubes (BNNT) Market Growth Weekly WallThe report proves to be a highly useful resource for players to secure a strong position in the Global Boron. Read more. NEWS. Hydrogenation Catalyst. March 29, 2019 - Cubic Boron Nitride Market 2019 – Global Industry Analysis, Trend By Growth, Statistics & Forecast Till 2025 The Market FactMarketdesk.org presents Global Cubic Boron Nitride Market 2019 industry research report that covers overall business insights and forecast. January 10, 2019 - Analyzing Highly Insulating Ceramics AZoMThis article presents using the Ultim Extreme for the characterization of ceramics such as Boron Nitride with highly electrically insulating properties. April 10, 2019 - Boron Nitride Market 2019 – Global Qualititive insight, Consumption Growth rate and Revenue Prediction till 2025 Industrial HeraldGlobal Boron Nitride Market 2019 research study specify a clear overview of the current market including the past and the projected future of market size. April 3, 2019 - Teflon stirrers can skew lab science Futurity: Research NewsThe stirrers that mix cream into your coffee don't make much difference. But in a chemistry lab, using the wrong stirrer can introduce errors. April 16, 2019 - Light Produced from Exotic Particle States R & D MagazineWhen particles bond in free space, they normally create atoms or molecules. However, much more exotic bonding states can be produced inside solid objects. April 16, 2019 - Global Hexagonal Boron Nitride Market 2018-2023: Trends, Challenges, Growth Policies, Companies, Regions DD News HeraldHexagonal Boron Nitride Market report provides a detailed analysis with current and future Opportunities to clarify the upcoming investment in the market. April 18, 2019 - Global Superabrasives Market 2019 - Henan Huanghe Whirlwind, WorldWide Superabrasives, Lands Superabrasives, CR Gems Superabrasives, Advanced Abrasives Industry ModuleReport of Superabrasives Market provides all study material concerning summary, growth, demand and forecast analysis report altogether across the globe. April 1, 2019 - Global Super Abrasives Markets 2018-2019 & 2023 - Market is Estimated to Reach USD 6667.08 Million - ResearchAndMarkets.com Associated PressPress release *content* from Business Wire. The AP news staff was not involved in its creation. March 15, 2019 - Propane oxidative dehydrogenation over highly selective hexagonal boron nitride catalysts: The role of oxidative coupling of methyl Science AdvancesHexagonal boron nitride (h-BN) catalyst has recently been reported to be highly selective in oxidative dehydrogenation of propane (ODHP) for olefin production. April 8, 2019 - Global Boron Trichloride Market 2019 - American Gas Group, Air Products, Praxair, Tronox, Matheson Industry ModuleReport of Boron Trichloride Market provides all study material concerning summary, growth, demand and forecast analysis report altogether across the globe. October 29, 2018 - Using Boron Nitride to Improve Electronics DesignNewsOvercoming a key obstacle to using boron nitride in electronics paves the way to dramatically improved performance for future components and devices. September 19, 2018 - Hexagonal Boron Nitride (hBN) Monolayer on 3x3 Copper Foil : Quote, RFQ, Price and Buy AZoNanoGrolltex's 25 micron-thick copper foil is sourced from a reliable and quality-assured supplier in the United States. September 4, 2018 - Cubic Boron Nitride Hones for Improved Surface Finishing Machine DesignA recent case study on flexible cubic boron nitride (CBN) grit hones show how they are ideal for restoring the surface integrity of machined superalloys. December 19, 2018 - Once unstuck, boron nitride nanotubes show promise NanowerkNew research could lead to better protective shields for electronics, biomedical advances.